Kyle Chalmers is an Australian freestyle sprinter and Olympic gold medalist. He trains with Marion Swimming Club under coach Peter Bishop and competes for Australia’s national team. In 2017, he made the decision to withdraw from the World Championships to undergo heart surgery to treat a condition called Supraventricular Tachycardia. He went back to competing after a successful surgery, and has been winning medals for Australia since. In 2018, Kyle received The Patron Award at Swimming Australia’s Awards night. We looked at Kyle’s metrics to analyze how his metrics compared across the 2 meets and distances, and how they impacted his overall performance. 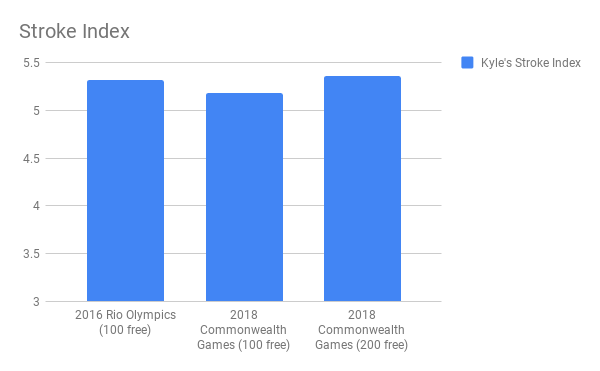 Kyle swam a faster 100m free at the 2016 Rio Olympics than he did at the 2018 Commonwealth Games. 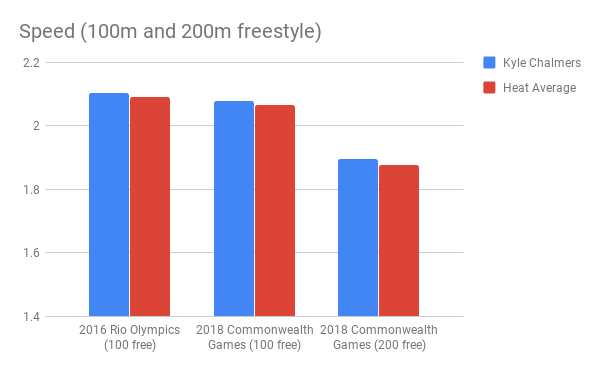 He generated more speed in both laps of the 100 free in 2016, clocking in faster splits and overall time, compared to his performance in 2018. But overall, the Commonwealth Games was a slower heat than the heat at the Olympics, and Kyle’s speed in both competitions was above average, landing him in top spots in both races. Kyle’s average speed in the 200m freestyle was also faster than the heat average. In all 3 events, Kyle’s speed fell in the lower end of the range on the first half of the race. It was on the back half of each race where he charged past his competitors. 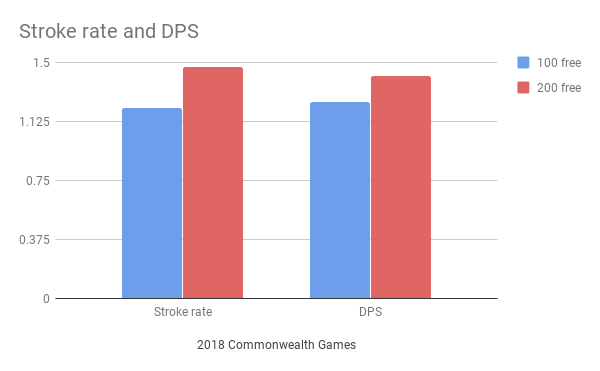 Kyle had the highest average DPS, and one of the slowest stroke rates in the 100m freestyle heat at the Commonwealth Games. In the 200m free, Kyle produced even higher distance per stroke, pulled at a slower stroke rate (compared to his 100m freestyle). Kyle’s high DPS, combined with his fast speed, resulted in high stroke index across all 3 races. On average, he swam his 200m free more efficiently than his 100m free. In the 100m free, Kyle turned approximately 0.3 seconds faster in 2016 than he did in 2018. 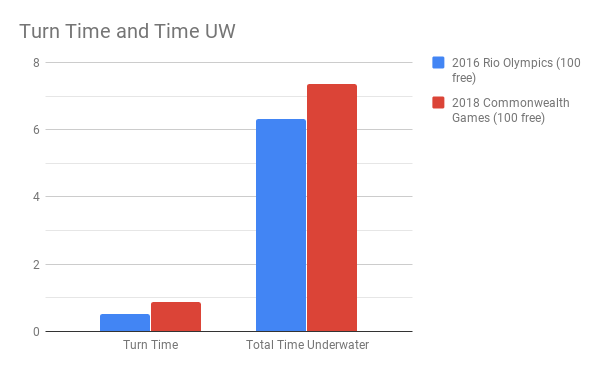 And off the walls, he spent around a second longer underwater in 2018 than in 2016, which could explain the extra stroke he had to take in 2018, given he had nearly identical DPS both years. Making slight modifications to race strategies for different distances of the same stroke can be effective. Kyle Chalmers generally pulled at a high DPS and slow stroke rate. But, a comparison of his metrics between the 100 and 200 free reveals that his DPS increased further and slowed even more in the 200. Both strategies were effective for each event, earning him medals in all 3 races. A strong finish wins races. Kyle doesn’t necessarily start his races slow, but in all 3 events, he had been falling slightly behind until the halfway mark. It wasn’t until the second half of each race when he gained the lead. He finished behind Duncan Scott in the 100 free at the 2018 Commonwealth Games, but he won second place win after being the last to split on the first 50. Stroke efficiency plays a key role.